BPM-X is works on many project scenarios, that always derive to have the best value based on use-cases and given resources. In the case of System Architect it is a great tool for architects managing and analyzing model assets in central repositories governed by frameworks like DoDAF. But in an ERP project initiative the business (functional) requirements and activities can be mapped much more easily and efficiently by using the Visio tool. In the case of DoDAF 2.02 (DM2) e.g. 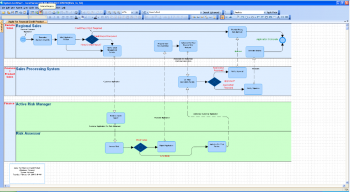 using the OV-6b or OV-6c operational views combined with BPMN 2.0. The mapping of models needs to follow defined DoDAF standards of the central repository and System Architect requirements like supporting the correct tool versions as with 11.54. IBM Rational System Architect BPMN diagram example. Convert existing System Architect best practice content to Visio format to support practitioners scoping the diagram content in workshops. Use native Visio or BPM-X Designer for modeling of diagrams being compliant to System Architect standards such as DoDAF 2.0 OV-6c. Having mass import of Visio diagrams into System Architects encyclopedias with automatic fault corrections of diagrams. Publish diagrams to HTML5 or using SharePoint as a process portal. Leverage enterprise reporting techniques with Reporting Services for analysis and web based publishing of model data. Bidirectionally link IBM Rational® System Architect with Microsoft Visio® and exchange model data and diagrams. The following BPMN example shows a BPMN 2.0 process flow in System Architect. Here we support Microsoft Visio 2007, 2010, 2013 and 2016. 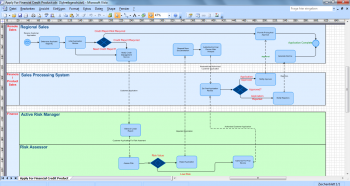 Microsoft Visio using the IBM Rational System Architect BPMN diagram example. In Visio the models can be modified or new models (=diagrams) can be created using a stencil with shapes being compliant with the leading standard defined by System Architect. When using BPM-X Designer for Visio also the rule set of the leading modeling conventions can be used to deliver high quality models in Visio.